Dental crowns also known as a dental cap, are popular procedures for broken or damage teeth. It is a type of dental restoration that fully cover the tooth and above the gum line. It is a rigid cap which restores a tooth to its ideal anatomic contours and function, whilst at the same time, protecting the underlying tooth. You may need several appointments. On your first appointment, cleaning and removing decay from the tooth while be the first step, under local anesthetics. You may need to have your tooth reshaped to allow a crown to be properly fitted. A mold is made of your tooth so the crown can be made to fit your tooth in the lab. Impressions will also be made of the jaw to ensure that the crown made for you will fit in with the rest of your mouth. While the lab is making your crown you will be fitted with a temporary crown so you are not in any pain. On your second appointment; when you are happy with the look and the fit of your crown it will be fitted to the tooth using cement or a dental adhesive. The dentist will make the crowns’ color match your other teeth and should be unnoticeable. 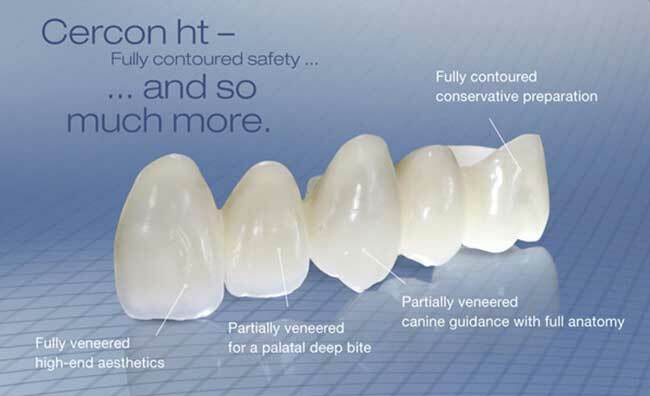 BEST on the market: Cercon® Zirconia is an all-ceramic material for exceptional strength, beauty and biocompatibility.